The entire genomes of 91 human sperm from one man have been sequenced by Stanford University researchers. The results provide a fascinating glimpse into naturally occurring genetic variation in one individual, and are the first to report the whole-genome sequence of a human gamete  the only cells that become a child and through which parents pass on physical traits. "This represents the culmination of nearly a decade of work in my lab," said Stephen Quake, PhD, the Lee Otterson Professor in the School of Engineering and professor of bioengineering and of applied physics. "We now have devices that will allow us to routinely amplify and sequence to a high degree of accuracy the entire genomes of single cells, which has far-ranging implications for the study of cancer, infertility and many other disorders." Quake is the senior author of the research, which will be published July 20 in Cell. Graduate student Jianbin Wang and former graduate student H. Christina Fan, PhD, now a senior scientist at ImmuMetrix, share first authorship of the paper. Sequencing sperm cells is particularly interesting because of a natural process called recombination that ensures that a baby is a blend of DNA from all four of his or her grandparents. Until now, scientists had to rely on genetic studies of populations to estimate how frequently recombination had occurred in individual sperm and egg cells, and how much genetic mixing that entailed. "Single-sperm sequencing will allow us to chart and understand how recombination differs between individuals at the finest scales. This is an important proof of principle that will allow us to study both fundamental dynamics of recombination in humans and whether it is involved in issues relating to male infertility," said Gilean McVean, PhD, professor of statistical genetics at the Wellcome Trust Centre for Human Genetics. McVean was not involved in the research. The Stanford study showed that the previous, population-based estimates were, for the most part, surprisingly accurate: on average, the sperm in the sample had each undergone about 23 recombinations, or mixing events. However, individual sperm varied greatly in the degree of genetic mixing and in the number and severity of spontaneously arising genetic mutations. Two sperm were missing entire chromosomes. The study has long-ranging implication for infertility doctors and researchers. "For the first time, we were able to generate an individual recombination map and mutation rate for each of several sperm from one person," said study co-author Barry Behr, PhD, HCLD, professor of obstetrics and gynecology and director of Stanford's in vitro fertilization laboratory. "Now we can look at a particular individual, make some calls about what they would likely contribute genetically to an embryo and perhaps even diagnose or detect potential problems." Most cells in the human body have two copies of each of 23 chromosomes, and are known as "diploid" cells. Recombination occurs during a process called meiosis, which partitions a single copy of each chromosome into a sperm (in a man) or egg (in a woman) cell. When a sperm and an egg join, the resulting fertilized egg again has a full complement of DNA. To ensure an orderly distribution during recombination, pairs of chromosomes are lined up in tight formation along the midsection of the cell. During this snug embrace, portions of matching chromosomes are sometimes randomly swapped. The process generates much more genetic variation in a potential offspring than would be possible if only intact chromosomes were segregated into the reproductive cells. "The exact sites, frequency and degree of this genetic mixing process is unique for each sperm and egg cell," said Quake, "and we've never before been able to see it with this level of detail. It's very interesting that what happens in one person's body mirrors the population average." Major problems with the recombination process can generate sperm missing portions or even whole chromosomes, making them incapable of or unlikely to fertilize an egg. But it can be difficult for fertility researchers to identify potential problems. "Most of the techniques we currently use to assess sperm viability are fairly crude," said Quake. The researchers also identified 25 to 36 new single nucleotide mutations in each sperm cell that were not present in the subject's diploid genome. Such random mutations are another way to generate genetic variation, but if they occur at particular points in the genome they can have deleterious effects. "This could serve as a new kind of early detection system for men who may have reproductive problems," said Behr, who also co-directs Stanford's reproductive endocrinology and infertility program. 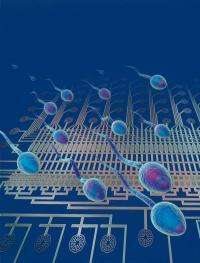 "It's also possible that we could one day use other, correlating features to harmlessly identify healthy sperm for use in IVF. In the end, the DNA is the raw material that ultimately defines a sperm's potential. If we can learn more about this process, we can better understand human fertility."